As the Daily Express reports, the Institute of Alcohol Studies (previously the UK Temperance Alliance) has issued some figures on the affordability of alcohol. Supermarket beer is almost 188 per cent more affordable today than it was 30 years ago, according to a study. Wine and spirits sold in supermarkets and off-licences are 131 per cent more affordable than in 1987 compared with 34 per cent cheaper in pubs, bars, hotels and restaurants - or “on-trade” venues - figures from the Institute of Alcohol Studies (IAS) show. The Express's positive take on the figures was not shared by the IAS, nor by most of the other newspapers who reported it. It is all part of the campaign for minimum pricing in England. Chris 'No Further Action' Rennard will be asking a question about it in the House of Lords today and he has written a piece for Politics Home in which he repeats the figures above and concludes that '[g]reater affordability helps to fuel alcohol consumption'. Rennard does not pause to wonder why, if the link between affordability and consumption is so strong, consumption is lower than it was thirty years ago (see below). Nor does he mention the fact that the sale of beer - which has supposedly become much more affordable - has fallen by a third since 1990. The IAS's usual line on the price of alcohol prices is that it has got 60 per cent more affordable since 1980. This figure comes from the NHS and is true so far it goes. However, 'more affordable' is often misinterpreted as 'cheaper in real terms'. The Times makes that mistake today with its story 'Cheaper alcohol boosts calls for minimum prices'. But affordability is more of a measure of rising incomes than falling prices. The NHS data shows that the retail price index has risen by 297 per cent since 1980, which is to say that prices have increased threefold, while the alcohol price index has risen by 377 per cent. 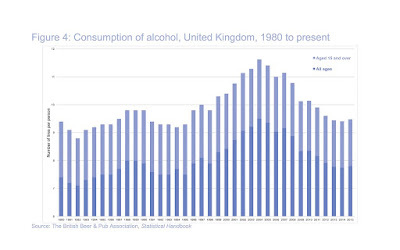 Alcohol has therefore become more expensive in real terms. And yet the proportion of household income spent on alcohol has fallen from three per cent in 1988 to 1.6 per cent in 2016. This is good news for everybody except the temperance lobby, but it is because incomes have roughly doubled in real terms since 1980, not because alcohol has got cheaper. Incomes have greatly outstripped inflation and, to a lesser extent, the rising price of alcohol, but alcohol has nevertheless become more expensive in real terms. The IAS figures are interesting because they show the changes in prices in different parts of the market. This is the key graph. Click to enlarge. The anonymous author of the IAS report does not explain where he or she got the alcohol price figures so I can't verify them (if you have them, please leave a comment). I have to say that I'm a little suspicious of the steepness of the rise in affordability after 2013, in particular, but assuming the data to be broadly correct, it suggests that off-trade beer, wine and spirits have become cheaper in real terms while the same drinks in the on-trade have become more expensive. They have all become more 'affordable', of course, but so has pretty much everything in the UK except housing and healthcare. The IAS bang on about the alcohol duty escalator flattening the affordability index between 2008. Like Nick Sheron and Ian Gilmore, they portray this as some sort of magic bullet for alcohol harm. Sheron and Gilmore's trick is to pretend that alcohol consumption didn't start falling until the escalator began in 2008. The decline actually began in 2004. The IAS's trick is to ignore the decline in average incomes during and after the recession. You can see exactly the same flattening in the graph above when the economy contracted in the early 1990s. As incomes fall, everything, including alcohol, becomes less affordable. 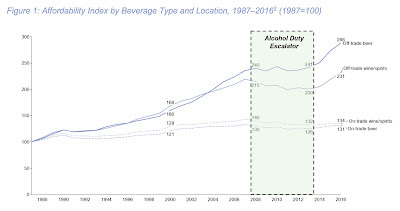 The escalator had an added effect, of course, but it's not as if 2008-13 was the only time in the last thirty years that the government has increased alcohol duty. 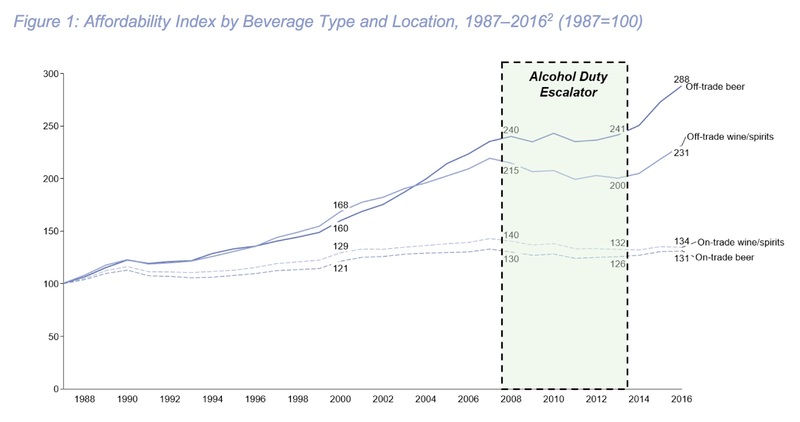 It is good news for consumers that alcohol producers and retailers have become more efficient in the last thirty years. It's only a shame that the government has burdened the on-trade with so much regulation and taxation that it cannot do the same. We expect things to become more affordable as we get richer. That is the whole point of getting richer. Only the most mean-spirited puritan would look back fondly on the days when households spent twice of much of their income on alcohol. The temperance lobby does not care whether alcohol becomes less affordable because of recessions or because of taxes or because of minimum pricing. So long as people become poorer, they're happy. With each day that the Government equivocates on this [minimum pricing], 65 people die from alcohol-related causes. I am tired of campaigners using juxtapositions like this. Will minimum pricing stop 65 people dying from alcohol-related causes every week? No. So what is the relevance? Rennard claims that minimum pricing will prevent 525 alcohol-related deaths per year, a figure that is presumably plucked from one of the worthless Sheffield reports. Let's imagine that the figure of 525 is a realistic expectation rather than a politically-driven fiction. That would reduce the number of daily deaths (which is also an exaggeration, by the way) to 63.4. Given how flaky the figures are to begin with, this is a rounding error.